CounterCultural Kitchen: Festive Food - CounterCultural. CounterCouture. 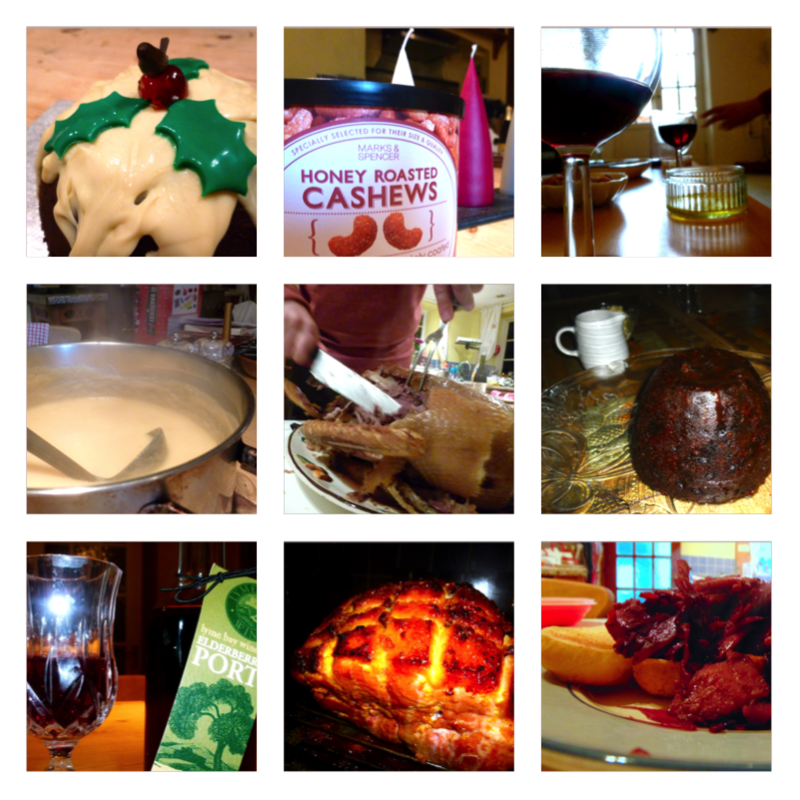 This a little bit late but I had to share with you all the amazing food we had over the festive period. Due to getting my head around working in a new job and being Monday-Friday, 9am-5pm, I haven’t had time to do a detailed post on any of these but I thought I could share them in brief with you. Rocky Road Christmas Pudding: This particular delight was my entry into the Stonehenge Christmas party’s bake off. Although I didn’t win any prizes, I did have a fantastic time making and decorating it. It was gluten and dairy free but did not taste like cardboard, as the catering manager had suggested it would. Everyone seemed to enjoy it as well. M&S Honey Roasted Cashews: Mum bought these back in November for me as a Christmas Day treat. They were somewhat pricey but oh so tasty. I’ve fallen in love with salted and honey roasted nuts recently, with cashews tying with almonds for the position of favourite. The perfect snack to nibble during a game of Bird Bingo. Red Wine, Crackers and Garlic Rapeseed Oil: The perfect way to relax after a Christmas Day service. I may have enjoyed this at the same time as the cashews but I always knew I would over do it at Christmas. The garlic rapeseed oil is particularly delicious, coming from a Somerset company called Fussels. It really is delicious and doesn’t make your breath stink either. Parsnip & Apple Soup: Every year Mum makes a soup on Christmas Eve to reheat for lunch after church. It makes Christmas Day so much more relaxed as we all muck in with cooking Christmas dinner after opening presents. This year it was a very sweet but sharp parsnip and apple soup. I thought it was delicious though not all my family were convinced. No matter, it just meant there were leftovers for Mum and I.
Roast Goose: This was the second time we have cooked goose for our Christmas dinner. It is the most delicious meat as it effectively self-bastes due to the amount of fat under the skin. It was ridiculously tender and practically fell apart as Dad carved it. My mouth is beginning to water at the very thought of it. Christmas Pudding: I don’t really need to explain this. Other than the fact that this year ours flamed incredibly well. One of my favourite Christmas delights. Elderberry Port: I picked this little delight up at the Stonehenge late night Christmas shopping. Making use of my staff discount while I still had it. The port is actually very well rounded but rather strong so I’m still working my way through. Then again, we also had various mulled wines, cider, gin, Irish Meadow and Disarronno too so our cupboards are still far from dry. Glazed & Baked Ham: This was a really big deal for me. The baked ham is my favourite of the traditional Christmas meats but Mum did not see the need for one next to the goose. So instead I glazed and baked one on Boxing Day. Big thank you to Delia Smith as I used one of her recipes with demerara sugar and English mustard. It not only looked amazing but also tasted great. Leftovers: The great Christmas food tradition! Bubble and squeak accompanied the hot ham on Boxing Day. The rest of the week was dedicated to finding ways to use up the ham and braised cabbage. My favourite was frying of the ham and cabbage together before piling it up on toasted brioche. I have definitely been converted to using sweet brioche for savoury dishes. It definitely worked with the salty ham and slightly vinegary cabbage. So that was CounterCultural Kitchen‘s take on festive food. How about you? How do you like to celebrate the biggest feast of the year? The post CounterCultural Kitchen: Festive Food was first seen on CounterCultural. CounterCouture.